I perchance came upon this wee one. I named her Spot. 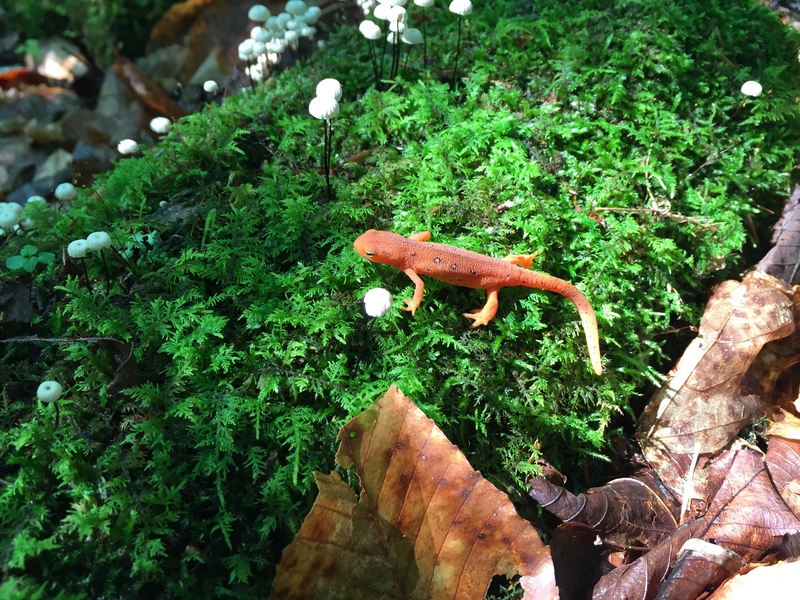 She is a Red Spotted Newt and no she was not turned into one by a witch! Carefully picking Spot up and holding her in my hand we chatted about life and all manner of things. I discovered that Spot likes cool damp leaves and the comfort of moss and mushrooms. I told her I love to be in the forest and put my feet in cold streams. We became fast friends. Spot and me. Soon it was time to leave Chittenden Brook and go back to the city… but before I left she told me of a magical place to visit near the brook. I took her advice and spent several hours communing with many of her friends chatting about life and all manner of things. I am looking forward to my return to this wonderful place which sparkles of mica and quartz and dear Orange Newts. A magical photo. Not only love the delicate salamander, but also the tiny white mushrooms on black stems, the life-giving green moss (or whatever it is) and the striking contrasts throughout. One can also sense the background quietness, composing this scene. Thank you. Thank you highwhistler. This place in Vermont, Chittenden Brook is a wonderful place, radiant with Mica and Quartz everywhere… underground and the boulders of course… everywhere and a beautiful peaceful quality that was so soothing. The Newt was a great find. 😍 We are going back in about a week I can’t wait!